(Nanowerk News) Designing materials that better respond to dynamic loading can help vehicles minimize vibration, better protect military convoys or potentially make buildings safer during an earthquake. Granular materials -- assemblages of particles that range broadly from powders to sand to microscopic beads of glass -- are one of the least understood forms of matter due to the incredibly complex ways that those particles interact. But those complicated physics also offer tantalizing potential to create materials with unique properties -- like the ability to absorb impact energy in customized ways. 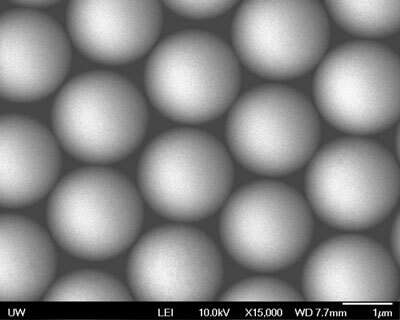 In a paper published May 13 in Physical Review Letters ("Complex Contact-Based Dynamics of Microsphere Monolayers Revealed by Resonant Attenuation of Surface Acoustic Waves"), University of Washington mechanical engineers have for the first time observed and analyzed collective interparticle vibrations in two-dimensional microscale granular crystals -- a type of designer granular material. This understanding and ability to predict how these tiny arrays of particles behave as forces are applied is a first step in creating novel materials that could be used for everything from impact mitigation to signal processing, disease diagnosis, or even making more controllable solid rocket propellants. One of the more interesting characteristics of granular materials is that they are dynamically responsive -- when you hit them harder, they react differently. "You can take a pencil and push it through a sandbag, but at the same time it can stop a bullet," said senior author Nicholas Boechler, a UW assistant professor of mechanical engineering. "So in some ways what we're trying to do is build better sandbags in an informed way." The research team discovered that microscale granular crystals -- made of spheres that are smaller than a human blood cell -- exhibit significantly different physical phenomena than granular materials with larger particles. Adhesive forces play a more important role, for instance. The array of tiny particles also resonates in complex patterns as forces are applied and they knock into each other, including combinations of up-and-down, horizontal and rotational motion. "This material has properties that we wouldn't normally see in a solid material like glass or metal," said lead author and UW mechanical engineering doctoral student Morgan Hiraiwa. "You can think of it as all these different knobs we can turn to get the material to do what we want." The mechanical engineering team manufactured the two-dimensional ordered layer of micron-sized glass spheres through self-assembly -- meaning the millions of particles assemble themselves into a larger functional unit under the right conditions. Building large amounts of material composed of microscopic particles, such as a panel for a vehicle, is impractical using conventional manufacturing techniques because of the amount of time it would take, Boechler said. Self-assembly offers a scalable, faster and less expensive way to manufacture microstructured materials. The team then used laser ultrasonic techniques to observe the dynamics between microscale granular particles as they interact. That involves sending a laser-generated acoustic wave through the crystal and using a separate laser to pick up very small vibrations of the microscopic particles. Researchers have studied the dynamics of granular crystals with large particles, but this is the first time such complex dynamics have been observed and analyzed in microscale crystals, which have advantages over their larger counterparts. Their small size makes it easier to integrate them into coatings or other materials, and they also resonate at higher frequencies, making them potentially useful for signal processing and other applications. "The larger systems are really nice for modeling, but can be difficult to integrate into many potential products," Boechler said. So far, the team has conducted its experiments using low-amplitude waves. Next steps include exploring high-amplitude, nonlinear regimes in 3-D crystals -- in which the granular particles are moving more vigorously and even more interesting dynamics may occur. "Ultimately, the goal is to use this knowledge to start designing materials with new properties," Boechler said. "For instance, if you could design a coating that has unique impact absorbing capabilities, it could have applications ranging from spacecraft micro-meteorite shielding to improved bulletproof vests."